Rabbit Stew: Tripping Up Trump! It's a bit damn late in the day for me to post this but if it gets a couple more signatures on the petition before it closes on Thursday (tomorrow!) then it won't have been in vain. Mr. Trump (as detailed in an article in the Guardian here) wants to evict the salmon fisherman and quarryman Michael Forbes from the home he shares with his mother so that he can build a golf-themed playground and housing estate for the ultra-rich on the land. Mr Trump has said of Forbes: "has always been dirty, sloppy and unkempt in his personal appearance and demeanor [sic]. He is a loser who is seriously damaging the image of both Aberdeenshire and his great country. "His property is a disgusting blight on the community and an environmental hazard, with leaking oil containers, rusted shacks and abandoned vehicles dumped everywhere. It is a very poor image and representation for the world to see of Scotland." The Rabbit Stew Blog says - thoughtfully and diplomatically as ever - Sod off, Trump! 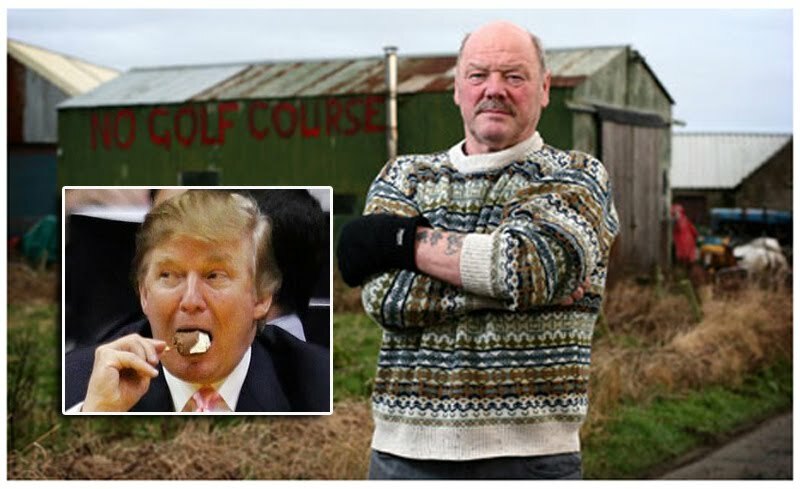 Join me in donating to support the campaign against the compulsory purchase of Forbes' land by visiting the "Tripping up Trump" site here and signing the petition to the Aberdeenshire Council here. PS yes of course i voted and pointed out the ungentlemanly way Mr Trump has conducted himself. Shocking behavior.